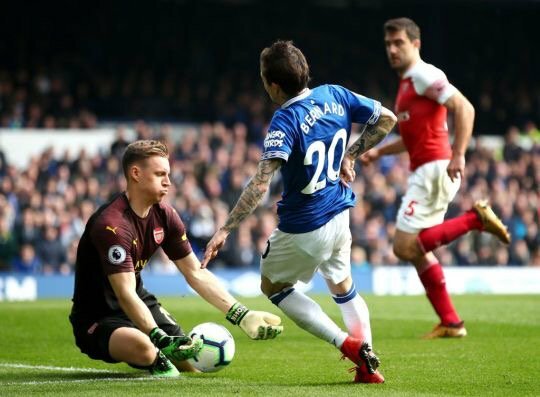 Arsenal manager, Unai Emery, has said Bernd Leno registered a ‘perfect’ performance in their 1-0 defeat to Everton on Sunday. Phil Jagielka’s goal in the 10th minute, was enough to secure victory for Marco Silva’s side at Goodison Park. Arsenal, meanwhile, struggled to threaten Everton and were unable to create clear-cut chances, even after Aaron Ramsey and Pierre-Emerick Aubameyang were brought on at half-time. The Gunners, who remain fourth after their defeat, were also fortunate to not concede in the second half, as Everton squandered a number of chances to increase their lead. And Emery has hailed Leno’s performance, after the German goalkeeper kept the scoreline down. “They feel strong here and physically they have players with good physical performances. “They pushed a lot but we controlled the first half better, like we wanted. “Offensively we needed to play with more players taking more chances. “We did that in the second half but we lost the balance defensively because we conceded more chances than we wanted. “Leno was perfect for saving us. We had three good chances and didn’t score,” Emery told Sky Sports.